Coming up in Melbourne, September 5th-13th is the 2013 Environmental Film Festival. The festival premiers environmental documentaries from Australia and the globe and looks set to be inspiring and informative across a range of issues. Festival organizers describe the films as 'traversing the relationship between humans and their environments, challenging the way people think about the natural world and inspiring them to discuss, explore and act'. Several sessions include panel discussions and there seems to be a real focus on inspiring change. Festival patron Bob Brown says "EFFM gives Australians a glimpse into the most pertinent environmental issues and reminds us that these issues are not all happening in faraway places, they are happening right here on our doorstep– and, it's time for all Australians to be a part of the solution,” says Festival Patron Bob Brown. 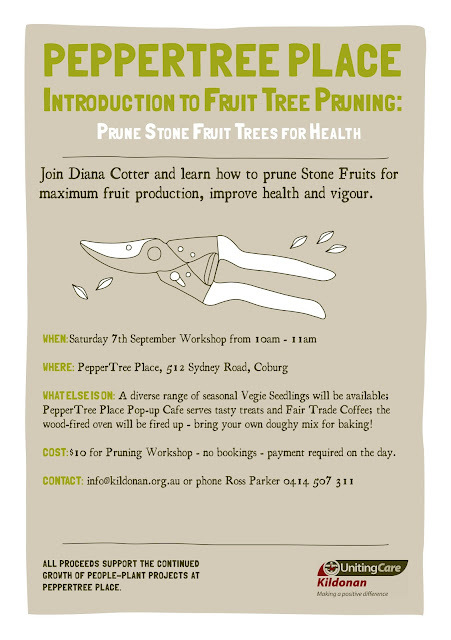 Of particular interest to local food gardeners might be The Fruit Hunters which follows the quest of rare fruit hunters. While it has a tropical focas this playful film is said to foster a "greater appreciation of our symbiotic relationship with fruit through culture, history, and ecology and glean a sense of our infinite biodiversity so clearly under threat by an all-consuming monoculture." Also standing out is the beautifully shot film More Than Honey. This Oscar nominated film by Markus Imhoof examines the crisis of diminishing honey bee populations and features research on wild and domestic bees around Perth. As Australia is described as having some the last healthy bees in the world it is a particularly pertinent issue to be aware of. The festival is hosted by Kino Cinemas. Check out the festival website here to peruse the full program and for ticketing details. Peppertree Place will be open for usual Community Gathering on September 7th - yep, that''s KRudd's Election Day. Coburg Primary School will be a venue for Voting so come and cast your vote then head on over for a relaxing cup of Coffee, Cake, swap your produce and browse the Community Nursery. Ross's Wood Fired Oven will be ready to take on your dough mixes so bring them for a community bake off! ChookChat @ Chookville will be on again with Paul from 11am - come down to learn and share your chook knowledge with others. Itchy feet? Want to share your skills with people who need it most? The Australian Red Cross has some inspiring openings for volunteers in Africa. The positions all aim to develop sustainable horticulture and local food security. Help subsistence farmers in a beautiful Ugandan village to establish a sustainable, organic and community-owned food supply using permaculture techniques. Assist with the establishment of two greenhouse gardens, create a permaculture network and train farmers in permaculture practice. 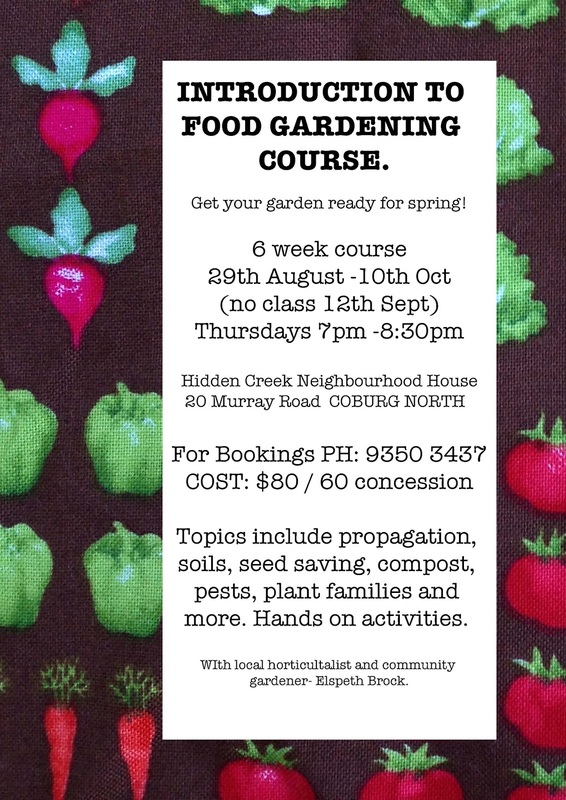 Interested in sustainable food production and community gardening? Then head to Kenya to support Red Cross with a range of food security projects. You will train volunteers and farmers in horticulture techniques and trial organic gardening methods. Horticulturalist Peter Newbigin working in Kenya says that organic farming is now being promoted - not as a label to attract discerning buyers, but as a way to reduce financial strain on low-income communities and improve the sustainability of production. All assignments are part of the Australian Volunteers for International Development program and cover travel, accommodation and living costs, as well as health and security support. Applications close on 29 August and the assignments begin in November. For more information visit the Red Cross website here or call (03) 9345 1834. A group of Permablitz designers got together to design the food gardens for South Melbourne Commons in 2011. Unfortunately the lease for the commons is not being renewed and will be closing the doors end of August. Please say farewell by going to the fund raiser film night this Thursday night! Time ticks away as we approach the end of the Commons as we know it, but that doesn't stop great things from happening! We've partnered with Transition Port Phillip for this film event. We can't wait to see it and share with you all! 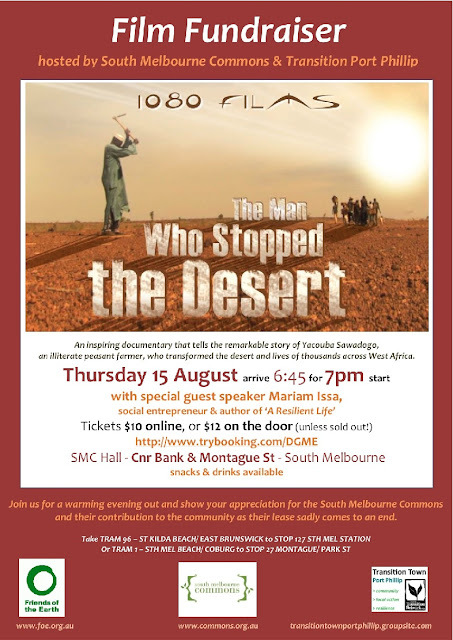 The Man Who Stopped The Desert tells the remarkable story of Yacouba Sawadogo, an illiterate peasant farmer, who transformed the desert and the lives of thousands across west Africa. This film screening is followed by a short talk with Mariam Issa, social entrepreneur and author of A Resilient Life. I'm often asked about this wonderful network, why it's here & how did it come about? 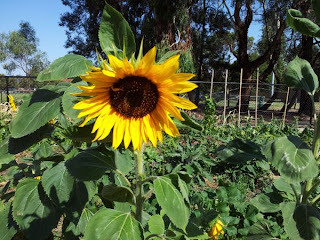 So, I thought I'd tell you a little story about the Moreland Food Gardens Network (MFGN)... and take this opportunity to reflect on what inspires me. The network was established through work I do in health promotion at Merri Community Health. 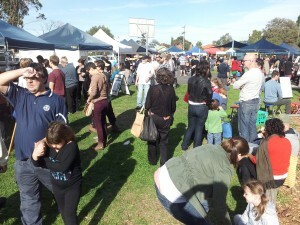 MFGN emerged in early 2011 through a former group that focused on food security issues in Moreland. There was a notable increase in local food projects, not just through the organisation’s work in food security, but more generally in the community... there's been a groundswell of grass root initiatives focusing on food. So MFGN was an attempt to respond to community needs to improve urban agriculture and food security in Moreland, by connecting people and creating opportunities to advocate and collaborate around important food issues. By inviting community members to join this group, it meant that it could act as a peer-support network for local residents & grass root initiatives as well as provide a platform to honor & facilitate local knowledge. The group is fairly young and to an extent still finding its feet. But the level of commitment & energy of its members is truly inspiring. It’s a reflection of the local food movement in Melbourne’s inner north. Like any group there are ebbs and flows, but I suppose the network maintains its structure through health promotion principles, the unique relationships and passion that exist with its members. There’s a terms of reference, an online website, facebook, twitter, a members' google-group, bimonthly gatherings and a healthy dose of flexibility that allows everyone to participate within their own capacity. There’s a great diversity in our membership base, ranging from local residents, gardeners, food activists, not-for-profit organizations, local food projects, schools, community health workers, local government officers, academics and social entrepreneurs. As a founding member, I learnt on the job that it’s a balance of clear structure & process with enough fluidity for creativity to flourish and new ideas to arise. It’s collective thinking and action driven by a common vision for a local, fair & sustainable food system that allows this network to work. From my experience, both personally and professionally, I found that networks & community groups are each very interesting, dynamic & unique in their own way. There always tends to be a core group of ‘main-action-people’ and other members who come & go. But ultimately it’s the fact that members continue being part of it, keeps it relevant and alive. I'm constantly amazed by the wonderful work our community is doing to relocalise and strengthen our food system. Projects keep growing in numbers and new opportunities for collaboration are constantly on the horizon. 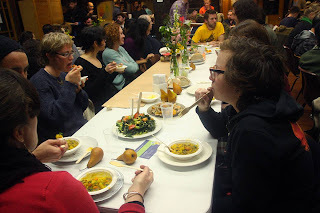 There are always stories to be shared over locally grown food and many delicious cups of tea - it's a certain magic that's hard to explain when people come together to share food and build community. 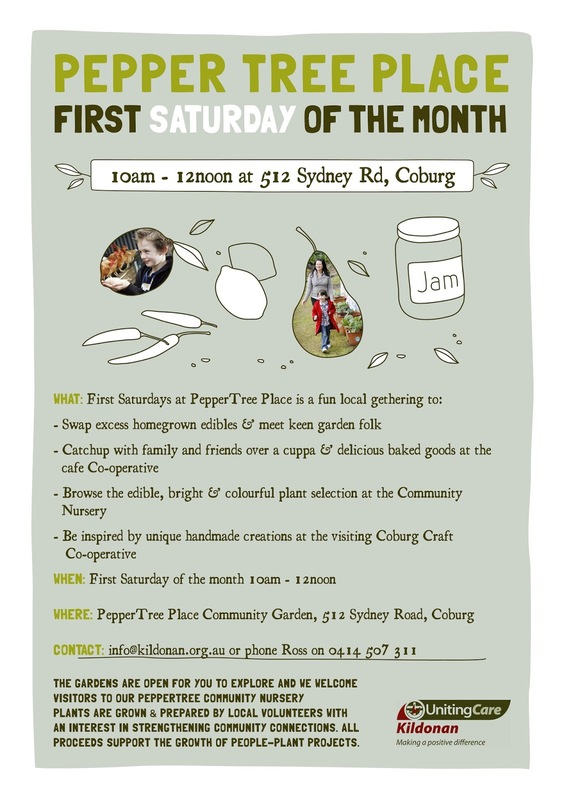 If you're around in a couple of weeks, please pop into the Coburg Farmers Market on Saturday 24th Aug and say hello, we'll have a stall there. Our fair food feast booked out quickly, but do drop in to another fair food week event and make a toast to the local food movement in our beautiful city. They'll be invited to pitch their policies to the captive audience on issues surrounding food security, food sovereignty and agriculture. We expect them to start from about 10 or 10.30 and the speakers will also participate in a Q and A session. The questions will be collected over the next few weeks from various community groups and collated then presented (perhaps by members of the audience) on the day. Sam and Aaron from Transition Coburg will be renovating the schools kitchen garden with recycled timber from the school wood pile. We have a big white tent which will (so far) be housing representatives from TT Coburg, Peppertree Place, the Moreland Food Gardens Network and maybe Robinsons Reserve who will be telling their respective stories. We hope it will be a great day and have entertainment and a lucky gate prize planned to draw a crowd. Entry to the market by Gold Coin Donation. To celebrate Fair Food Week, we'll be having a feast! Open Table and Moreland Food Gardens Network are teaming up to create a special feast using surplus produce grown in the neighbourhood. Open Table uses surplus produce to create wholesome community feasts. Moreland Food Gardens Network (MFGN) was established to connect people in Moreland to improve food access and promote urban agriculture. 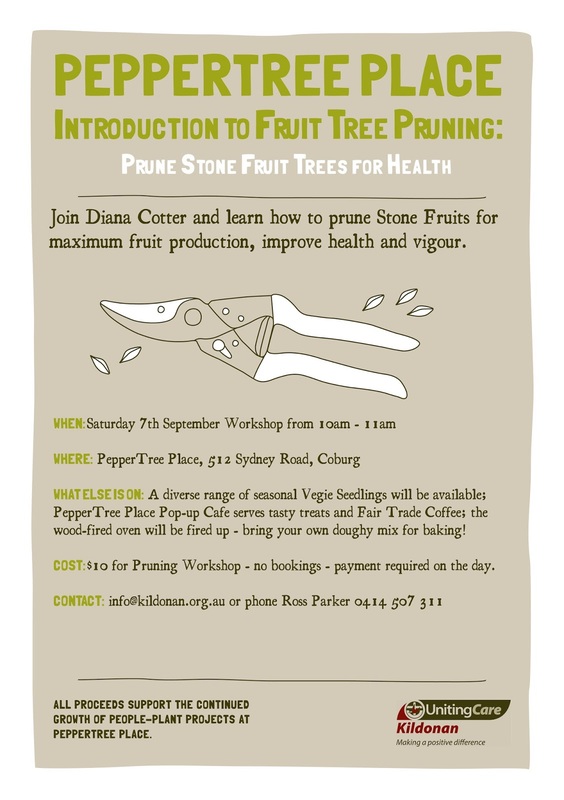 The course aims to help beginners get started and provide new ideas and tips for experienced gardeners. Fun practical activities. Please note the course dates have changed from the original Hidden Creek Neighborhood house program. New dates are- 29th August to the 10th of October (no class 12th Sept). See flyer above for further details and spread the word! The movement towards a fair, diverse and local food system for all Australians is growing! MFGN co-founder & nutritionist, Rasha Tayeh, has been working closely with the Australian Food Sovereignty Alliance to promote the People's Food Plan. In 2012, around 600 people were invited to participate in public forums to discuss a common-sense approach to a fair, sustainable and resilient food system and put together a viable People’s Food Plan for Australia. Participants from various public forums verified the growing social movement in sustainable food and farming practices in Australia. Public discussions translated into a new vision of transformation and steps to accomplish it. Forum participants imagined ways to change the existing corporate-dominated food system to one that prioritises people, their health and freedom to make informed choices about what they eat. In fact, here in Moreland, we hosted a workshop to create a healthier food system. Visit this blog post to read all about it. - Diversify the current food economy to encourage creativity, entrepreneurship and opportunity by simplifying existing laws and by introducing new legislation to make it easier to set up social enterprise co-operatives, and small-to-medium-scale businesses in the food sector. The People’s Food Plan for Australia will continue to be a part of the transition from an unfair and vulnerable food system to one that is equitable, local and resilient. A few months ago, we were joined by guest speakers Shawn Ashkanasy & Justin Hutchinson from Urban Commons and Liam Wallace from hip vs Hype. This cross-disciplinary gathering was a fun showcase of how food intersects with so many aspects of our lives. As you know, MFGN members come from a range of disciplines including health & nutrition, community gardeners, local government, education & not-for-profit organisations... this time, two designers & a developer were added to the mix! - how do people access & share food? - how do we design around food? - how do we create a liveable city? Come down to CERES Environment Park and get your hands dirty on our very own organic farm in East Brunswick. Organised specifically for the good ‘n’ fair food eaters of Melbourne for Fair Food Week, our two-hour workshop will get you doing real work on a seasonal organic farm that feeds the community – followed by a fair food feast, hosted onsite by The Merri Table. You’ll start the day with a short talk & tour, followed by a variety of fun farm activities where you’ll get to cherish the chooks, propagate some seedlings, and generally get your hands dirty down on the farm. Having worked up a healthy appetite, we’ll retreat to the beautiful Merri Table to regenerate over a sumptuous organic lunch. Vegan, Vegetarian and Gluten Free Options Available. Please let us know about any dietary requirements by emailing eleonore@ceresfairfood.org.au when you book. Book now using this link and then email us with any specific dietary requirements. CERES Environment Park is a not-for-profit environmental education centre, located on 4 hectares of rehabilitated landfill in East Brunswick, Melbourne. 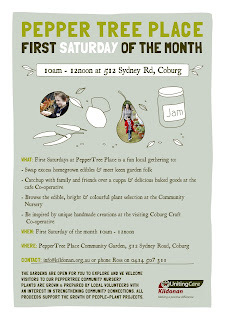 This event has been organised by CERES Fair Food, in conjunction with CERES Farm and The Merri Table. By supporting our social enterprises at CERES, you directly participate in helping us to expand our community engagement, social inclusion, and educational initiatives. CERES Fair Food is an organic food delivery service and online grocer, providing Melbourne with the freshest seasonal organic fruits, vegetables, and other yummy health foods, all sourced from our network local farmers and artisans. We pay farmers a fair price for their sustainably grown food, delivering fair food boxes of certified organic fruits, vegetables and other groceries such as bread, free range eggs and biodynamic milk to households across Melbourne. This content was originally posted on the Fair Food Week website which is fantastic and includes details of loads of events that have been organised for Fair Food Week. Coordinated by Australian Food Sovereignty Alliance (AFSA), to support the Peoples’ Food Plan, Australia’s first-ever Fair Food Week shines a light on our new story of food. The week’s events will celebrate the work of Australia’s fair food pioneers – the women and men doing the vital work of creating a fairer food system for all of us. What’s fairness got to do with food? Lots. Let’s start with farmers not being paid well by major retail chains for the food they grow and raise for us. Then there’s excessive food imports that unfairly disadvantage not only Australian farmers and farm workers but our food processors as well. And about much of that imported food… do we really know how it was grown and processed… and what was put on it to make it grow or easier to process… whether farm and factory workers enjoyed healthy, good and fair working conditions? And there’s one more thing about fairness, and that’s about fair access to good, tasty food for the thousands of Australians and their children living on low incomes. So, what’s that got to do with me? It’s your chance to do what it is that you do best when it comes to food wherever you sit in the paddock-to-plate-and-back-again journey. You’ll have our support to grab attention via print and social media, word of mouth advertising, promotion at markets, restaurants, cafes, and libraries. All over the country during the Fair Food Week people will create and participate in story-telling, workshops and other events the possibilities of which are limited only by your imagination. Most of all, during Fair Food Week, go out and enjoy food produced fairly — that’s fairly in the social, economic and environmental sense. Fair Food Week is a good idea we want to see take off because it’s about food fairness for all of us. So, it’s time to put on our thinking caps and plough into that random access memory of our brains, there to find creative, crazy, innovative and intriguing ideas for you and your friends to make something wonderful happen during Fair Food Week. And… we would LOVE to hear back from you ASAP so that we can begin to shape this week into wonderful reality. join our twitter conversation — #fairfoodweek. Contacts AFSA organisers in different cities and regions. Explore the West Brunswick Community Garden and food forest, meet the gardeners and find out how to get involved. This community garden and adjacent food forest of over 25 mature productive trees are a hidden refuge and great example of community food growing in urban public space. They’re being rejuvenated through the hard work and enthusiasm of volunteer local residents with support from City of Moreland Council to establish a hub for locals to connect and grow (or learn about growing) their own food. Join gardeners at the monthly Garden & Gather session held on the 4th Sunday of every month. Everyone is welcome to come along for a tour and see how our projects are going, to learn what’s planned and to see how you can become involved! Sounds appealing right? Come along! Your community garden needs you! How to Register: RSVP by email to grow.eat.moreland@gmail.com so we can make sure we have enough afternoon tea. Moreland Community Gardening are a bunch of Moreland volunteers and keen gardeners who are fixing up and taking care of the West Brunswick Community Garden as well as the adjacent food forest located in Dunstan Reserve West Brunswick. They want to see a network of community-based food growing opportunities around Moreland where people can come to grow their own food or to learn how.